If you have seen one political campaign, you have seen them all — and Portugal is even less imaginative than most. For the two largest parties (who are so much alike that it’s hard to understand the differences), “ideology” is out of the picture, and has been so since 1985, so they fight around “ideas” (leaving “ideology” for the extreme left range of parties, which have no hope to ever be elected anyway). But there is a limit to what you can say. The current opposition is focusing on “telling the truth” and “not promising what they can’t do”, since they saw that lying to the Portuguese with false claims of future prosperity will never get them elected. Sócrates, in truth, might think exactly the same way — after all, nobody can predict the future, and even though his carefully laid out plan in 2005 might have worked if it weren’t for the 2008 financial crisis, the truth is, from the voters’ perspective, all he did was — lie. But saying “we won’t lie any more since we don’t know what the future is” is not a good campaign motto — specially if you have two parties saying the same thing. An energic campaign full of promises will naturally be very suspect — after all, that’s what the Portuguese got, and now things are even worse than before (far worse, in fact). So what is left? Obama’s advisors just gave the correct orientation: forget sound bites for the media. That’s less and less relevant these days. The media influences voters, but to go beyond the media, you have to engage the citizens — directly. And so Sócrates announced a “new model” of the campaign for 2009: one where only 10% of the people involved would actually be party members, and provide just the bare minimum of organisation. The remaining 90% would come from, well, regular, independent, and often apolitical volunteers. On the Internet. Spontaneously organising events, relaying messages through Twitter and Facebook, blogging on websites, doing all sorts of things on their own, and, generally speaking, spread the news around — without being part of the institutionalised news, or being officially part of the party. And also raise more funds that way, of course. Now, raising funds for political campaigns in Portugal has quite regulated limits. On the good side of things, all political parties get an amount of money from the State to do their campaigning (depending, of course, on how relevant the parties are, in terms of votes), and equal access to the media. This means that even the smallest parties with a handful of members can, at the very least, afford to print some pamphlets and post some signs and get a prime time slot on TV and radio. But there is an upper limit too — since the Portuguese, always mistrusting their politicians, don’t want too much to be spent on campaigning, but on the citizens. That means managing your money well. With the high costs for doing large-scale marketing, you can see where the problem is: the traditional methods of spreading your message country-wide, with signboards and events, quickly runs to that upper limit, and you have little idea on the efficiency of the money spent that way (a strategy used by the smaller parties is not to go for 100% coverage, but focus on the hottest spots where you might be visible by, say, 70% of the voters — enough to get them some votes and a handful of seats on the Republic’s Assembly, and also far more cost-effective than dealing with the remote locations where the remaining 30% of the citizens live). Thus, perhaps even more so than in the US, pushing the campaign to the digital media is a very sound strategy. The costs are really negligible. If, on top of that, you engage volunteers to do most of the work — by writing articles; by exchanging Twitter messages; by posting pictures on Facebook; by holding events in virtual presences done in Second Life — this means that a far vaster audience will be reached for almost zero cost. Well, there is always a cost, of course — the cost of organising things — but it’s way far less than traditional campaigning. But is it effective? I’d say “yes”, in the sense that it won’t reach all voters, but like the example before, it might reach 70% — the ones that have access to a computer and the Internet. And that’s a huge number of voters; if you can reach those with zero costs, you can pretty much focus on covering the remaining 30% with the traditional campaigning, and probably you would even able to return some of the unspent money (something, I’m sure, that a party would be delighted to do for the good press coverage they’ll get — “we’re saving costs this year because of the on-going financial crisis, and returning to the State coffers some of the money we didn’t spend”). But, of course, there is the backside to all this. Linking to all those social sites, like the official site for Sócrates’ campaign does (“Geração Activa” — Active Generation), bears a huge risk. People will talk back. The social media is not under the control of anybody — most are outside Portugal’s borders anyway — which means no way to figure out how people are going to react. And, remember, at least in Portugal, people are angry with the Sócrates government. Furious, in fact. While the Portuguese are generally benevolent, peaceful, and can’t bother to be violent (our democratic revolution in 1974 would have made Gandhi proud, it was one of the most blood-less and peaceful revolutions ever — a military coup where allegedly only 4 citizens died, shot by the political police. No one from the former regime was killed), they nevertheless can be quite unruly and rough in words. Specially, of course, if they feel that the Internet’s anonymity might give them an extra degree of freedom, to speak in public what they otherwise would never dare to do face-to-face. I have no idea how this will work out 🙂 Obama, as said, worked from the opposite camp: he was inciting his fellow Americans to change, get rid of the past, work towards the future, give them hope. Sócrates wants his voters to vote on him again and perpetuate his remaining in power, so he can — finally — conclude his plan, interrupted in 2008 with the financial crisis. It won’t be easy to deal with the unruly mob, and I’m personally quite curious about the reaction. But, of course, there is more! There was some excited debate on what it means that “a politician has come to Second Life“. If you read the many comments on those articles, you’ll see that people generally disagree that a politician “is in Second Life” if they have a virtual presence, a team, a staff, an organisation, a planned, official event, and people that organise it and lead the discussion. All that, strangely, is… not enough. Whereas on all other social media sites people would happily “accept” that the politician “is there”, they don’t accept that they’re “in Second Life”. Sócrates is about to change that. As you can see from the video and the site (which sadly is only in Portuguese), Second Life is certainly part of the virtual environments he wants to be “in”. And as the Obama team helping him out to get started was swiftly removed from office — after a minor snafu with a streaming session that went all wrong — and was replaced by a new team (yes, the very same one that put the Presidency of the Portuguese Republic in Second Life), Sócrates was advised to be even bolder: not to be shy, enter SL with his own avatar, and chat with the audience. 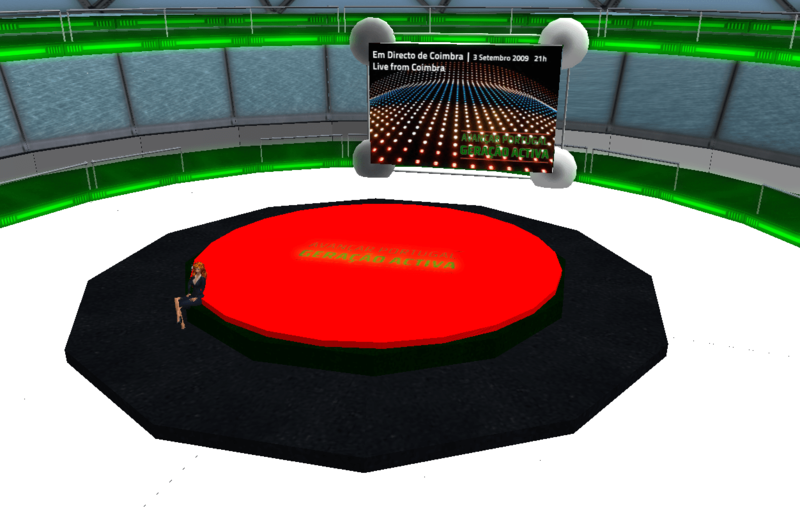 This will happen either today at 1 PM SLT at the Geracao Activa island, or next week, on Wednesday, at the same hour. Why the two dates? Sócrates is due to log in to SL several times during his campaign, but since this virtual presence is brand new, and finished in record time, at the last moment he might not have time to do a short chat. These things happen even in real life: campaigning is tough for the candidates, and one delay along the road means that some things will invariably be postponed. So at least two first dates are set down in the agenda for an “official” presence inside Second Life — more to be announced later — but, of course, these are conditioned by the available time. 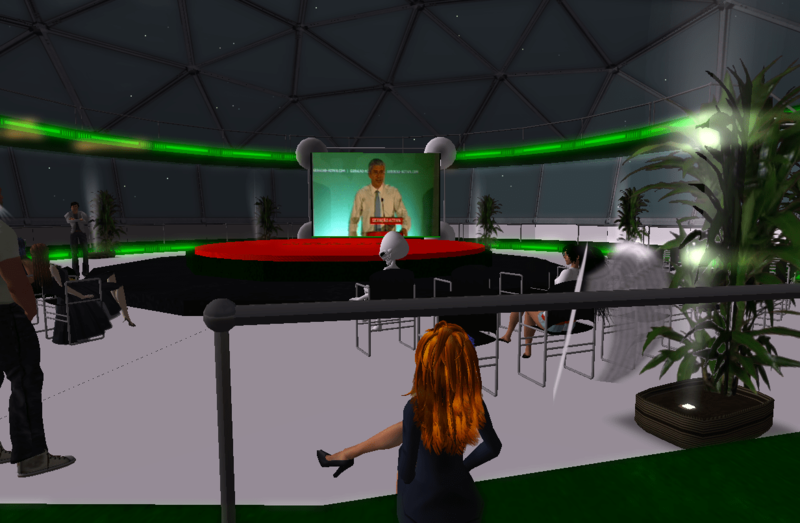 What can people expect from being in Second Life with a live audience? We all know how SL is so different from other social media tools. For one thing, like in RL, you really have absolutely no control over what people are going to say. On Twitter you don’t really get direct replies. On Facebook, MySpace, and all similar sites, you can exercise control over the replies you publish — similar, of course, to a blog, or an organisation-controlled forum. Flickr, YouTube, etc. are similar. Granted, you cannot avoid that others engage in discussion on their own pages — in fact, this is supposed to encourage that discussion! — but at least you have control over your own “virtual space”. Not so in Second Life! While griefers can be banned, you can’t make people “unsay” what they say in public. For a politician, this is just like being in front of an unruly crowd in real life, where you have no control whatsoever over what you’re going to hear from your audience. It’s better in the sense that you won’t be physically hurt — your avatar might be subjected to visual and verbal abuse (visual abuse will definitely get a lot of press! ), but not more than that. But it’s worse since people will not be constrained by any RL issues to do whatever they please, or to say what comes out of their minds. I remember, in the mid-1990s, when a group brought a politician to IRC, which was, at the same time, being streamed directly to TV. The same issue was brought up — how would people “manage the unruly crowd”? (Things actually went well during that session, but it could have been different…) There was a “damage control” team — channel ops who were on stand by to kick out unruly users (and some were definitely not the friendliest!). But since this was live TV, you would always be able to leave a message before being kicked out. If things got too uncontrolled, I suppose that the show’s director might have cut the scene, but there was always a risk. Granted, doing live chats with politicians and candidates on TV is boring. I mean, not for the participants, for whom it’s actually quite exciting; but for the TV audience, which will not bother with more than “a few seconds” of text chat scrolling up. Second Life, on the other hand, is a high-bandwidth environment — you have pretty images (great for TV! ), voice (good enough for radio! ), and text chat (good for transcripts!). Unlike IRC, if the discussion in-world gets interesting enough, you might show minutes of it on TV instead of seconds. This is naturally quite a huge advantage: free TV coverage for a candidate, that covers the technology, instead of focusing on the campaign, is naturally great, since it’s all done outside the usual time slots allocated for pure campaigning. And, of course, it will reach a different audience — most people will zap to another channel when the campaigning time slots are on, since they’re usually uninteresting, and just “more of the same”. But an in-world chat in Second Life with rich images, specially if there is the possibility of drama, is always something that an eager journalist might love to air on prime time news 🙂 And if not — the video footage of the event will most certainly be used to do a machinima to post it on all other social media, so nothing will be lost. Besides the fun in itself, this might just be an even better way to address an audience. The “filtered” nature of social media might make some people reluctant to participate there: what’s the point to do some flaming comments if they just get disapproved? Whereas in Second Life, you might get kicked out, but at least your comment will go through. And on the positive side — yes, there is one too! — if the crowd is more eager to discuss things than actually insult the candidate, this might be a worthwhile way for the candidate to spend some time in SL. Candidates during the campaign phase take time to talk to industry leaders, to organisations, to institutions, to schools — to all the ones that might positively influence the country they live in. The “public in general” might not get so much attention — a handshake here, a comment there, and not much more. In Second Life, the common citizen can come and sit on a roundtable with the candidate and spend some quality time with them — engaging in meaningful discussion. This, I believe, is the future of electronic democracy: a cheap way to engage with your constituency and listen to what the “common citizens” actually think. Without filters. Being an eager telecommuter myself, and always furious when a silly client “demands” that I join a meeting of an hour on a remote location somewhere, which will lead to wasting 4 or more hours in commuting time, just to have a talk that could perfectly be held in SL (or, well, on the phone… or by email) in half an hour, I can only hope that telecommuting comes to political campaigning too. Imagine a candidate that, instead of doing 5 or 6 meetings in a 24/hour day, spending 10 or 12 hours in travelling, and keeping their meetings to a minimum so they can swiftly travel around the country, would stay those 16 hours in-world, chatting with several groups while in his or her pyjamas. In the first scenario, you might have audiences of thousands, which is good, but the truth is, you won’t reach millions — your hope is that the old-fashioned media just picks up some sound bites from your speech and broadcasts it. So you’d get, say, a few seconds on TV or a paragraph on a newspaper, for the cost of organising an event on a remote place that would host “a few hundreds or thousands” of people, and all the expenses (and stress) of going back and forth. At the same time, the telecommuting candidate would just log in to Second Life early in the morning, and have a series of chats with, say, 40 people at a time. Do half an hour for each. You can reach over a thousand people that way — directly — without moving further than to the kitchen to grab a cup of coffee. But it doesn’t stop there. The chats can be archived on video or audio, transcoded to text, and put online for others to view or read. Then people can disseminate those chats and meetings via their own social media networks. Even if every attendant just tells five friends that they were “at a chat with the candidate”, that means an audience of 5,000 per day. And friends have friends and friends, and some of those are also journalists or opinion-makers with their blogs read by hundreds of thousands. So you message will get across, sooner or later — by video on YouTube, by audio on any podcasting service, by chat on blogs, Facebook, or wherever you post it. And it will be picked by the media too. In fact, this model might even hit information overload — remember, there are no filters, and no limit to information archival on the world-wide web, so nothing prevents this data stream to accumulate. At the end of the day, which candidate will have the most impact? The one that spent zero on the campaigning budget — but nevertheless contacted uncountable thousands of people — or the ones struggling to paste billboards all over the place which nobody sees or remembers anyway? In a time of financial crisis, where high-cost, low-impact solutions are frowned upon, I think that pushing campaigning debates to the digital world is the only thing that really makes sense. At the very very least, the candidates will be interacting with different people: the ones that never bother with the traditional media anyway. People that would never dream ever of travelling hundreds of miles to enter a crowded area to listen to a candidate’s very political speech, which would only be applauded by the eager party members anyway. These might, however, come to a nice friendly chat in Second Life — why not, if you can spare a few minutes without travelling anywhere and without getting stuck in a crowd of fanatics? — and have the opportunity to talk back instead merely of listening to a speech written by the candidate’s spin doctors. I have no idea if Sócrates will find the experience in Second Life valuable or not, or if he’s going to publish any results of it, and how successful it was compared to the more traditional campaigning venues. He might do so if he wins the elections. Those should be quite interesting numbers to get, so that others might be encouraged to do the same. What I know is that the irreverent organisers of this event are already planning to get the opposition in Second Life too, and organise a televised, live debate, streamed to national TV, where the candidates will discuss their political agenda live, in front of a SL audience — just like any other typical SL roundtable. If they manage to pull that off (and who knows, I have seen stranger things happening), I’m quite sure that this will be another massive paradigm shift. Although, of course, I’m sure that my immersionist friends are cringing in pain and thinking what on Earth made them join Second Life in the first place, now that people like Gwyn are so excited to have real world politicians all eagerly doing things in-world. See you later at 1 PM — or next Wednesday. Bring an extra dose of patience and leave the tomato launcher at home, if you please. But if you don’t, well, remember, there is nothing like free, unfiltered speech — treasure it!